Before I started playing DragoDino, I didn’t know what a DragoDino was. And now, with some decent hours of helping Bob, a cute little soul, try to find his lost egg, I still don’t really know what a DragoDino is. But that doesn’t matter, for narration and lore was obviously never at the forefront of TealRocks Studios’ plans for their fun little debut game. 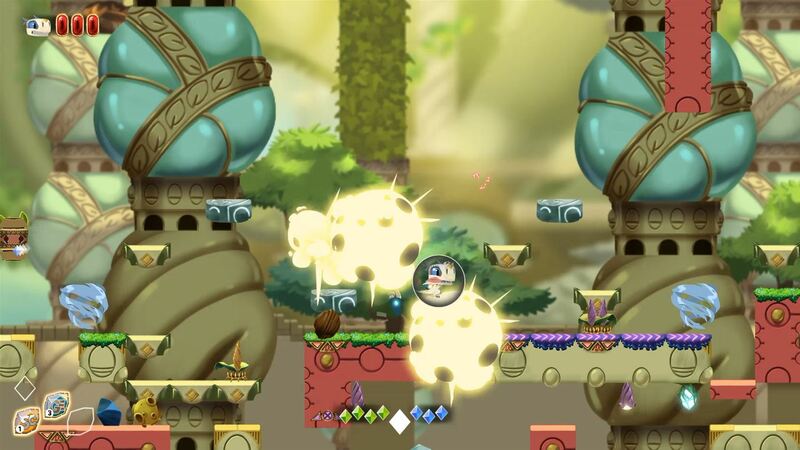 For the French indie studio instead decided that platforming, collecting and familiarity should be the core components of this platforming jumper. That’s fine in my book too because my gaming habits have changed massively over the years, forgoing the need to worry about what I’m doing, and instead replacing it with utter fun and enjoyment – two things that should be crucial to any gamer’s time. Unfortunately, for as delightful as DragoDino looks, I’m struggling to find too much enjoyment from what they’ve delivered. That in itself is a shame, because I really want to like DragoDino more than I actually do. Why that is I don’t know, but you could always put it down to the implementation of clever ideas being overrun by poor gameplay mechanics. 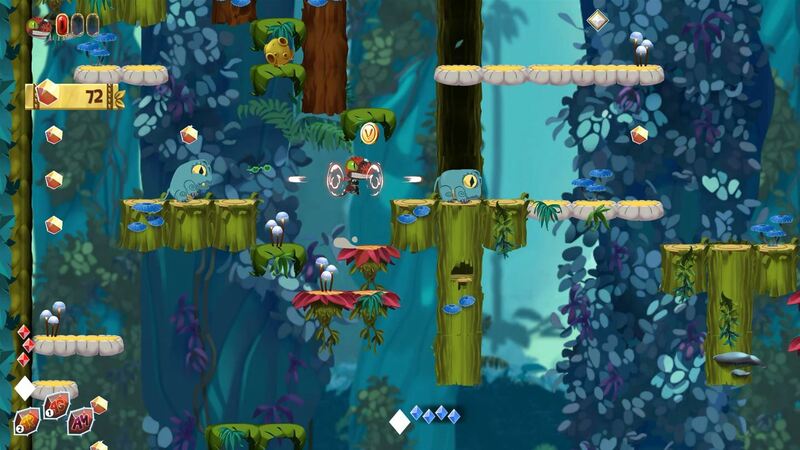 See, being given the opportunity to take charge of little Bob, as he heads off on vertically advancing adventure to recover his lost egg from the top of a giant tree, DragoDino should be a pleasing adventure that is full of platforming goodness. But for all the bright and beautiful visuals in the world, a platformer ultimately lives and dies by its mechanics. And that is where things go wrong for TealRocks. That’s quite possibly because throughout the 10 levels you’ll find yourself partaking in, huge amounts of frustration are caused by silly little things. Silly little things that should never be in a game of this type. A game that will obviously appeal to the younger gamers out there – whether that be right or wrong. If you thought it was bad enough to find issues with both the jumping from, and landing on, platforms, with the game never allowing you to feel confident in what is about to happen, then it gets worse as some strange controller issues see Bob (or any of his unlockable mates) constantly want to face to the right, making it super tricky to shoot or avoid enemies, especially when pixel perfect precision is very much required. This is so bad in fact that I’ve even had to change controllers, fearing that my much loved Lunar White offering was on its way out. But alas, multiple joypads later and the same issue arises, ensuring that Bob is swiftly dealt with by a jab in the back by any of the fast moving, or quick shooting, opponents who are trying to stop him from reaching his egg. Should you wish to add in an almost as frustrating checkpoint system that sees you having to redo multiple stages of levels should you even so dare to find yourself running out of health, and you’ll realise why DragoDino becomes a massively frustrating affair. Granted, it may just be that the difficulty level is too high for many a gamer – particularly the ones who will be drawn in by its cartoony graphics – and a little tweak here or there is probably all that is required in order for it to become a bit more accessible. But with the normal mode bringing the promise of checkpoints and 3 lives – ensuring that it is much prefered over the hard, with its lack of checkpoints and singular life system – you would think that the save points would actually help matters. But they don’t, and they are poorly placed which in turn sees any death leaving you having to repeat whole swathes of action; just with everything regenerated into different spots due to its procedurally generated ideology. It’s a shame too, because what is included is very good, especially for a studio’s debut title. With the change in levels mixing things up each and every time, a huge amount of collectibles ensuring that you just have to scour each and every corner of the stage in case you’ve missed something important, and a ton of various enemies that bring an assortment of attack forms and factors to the equation, DragoDino could, and quite possibly should, have all been so much better. Even the clever powerups that you pick up along the way could have gone some way to making DragoDino a bit of a standout initial offering, as the combination of 40 powerup types see stackable passive upgrades to allow Bob and his mates to be able to glide for longer, run faster or shoot further, with one off special attacks and shields at least able to help you try and stay alive for the long term. Whilst the majority of these will be gathered up on the playfield, as you destroy enemies and grab blue diamonds – with the latter allowing you to jump higher and out of each stage exit – should you manage to pick up enough coinage, the odd random shop will also help out massively. It’s a great place to be able to store your unwanted powerups for a later time too. If you so wish, you can play through DragoDino with a local co-op friend, allowing them to drop in and out as they see fit. This is good too, because with the awkward and frequent death scenario, having a second player alongside you just allows a bit of an edge over the foes who are out to destroy you, bringing reviving opportunities aplenty. Running through things with a partner also ensures that it is quicker to scoot through each stage as well, with the hunt for those precious blue diamonds slashed in half. At least that’s the case should your co-op partner know what they are doing because should they be one who struggles with gaming, then your experience will be over before you know it. This is most definitely not a game for parent and child bonding sessions. I want to like DragoDino more than I do, but the truth of the matter is that even though it’s a well thought out collect ‘em up with some clever ideas, the overall mechanics let it down. 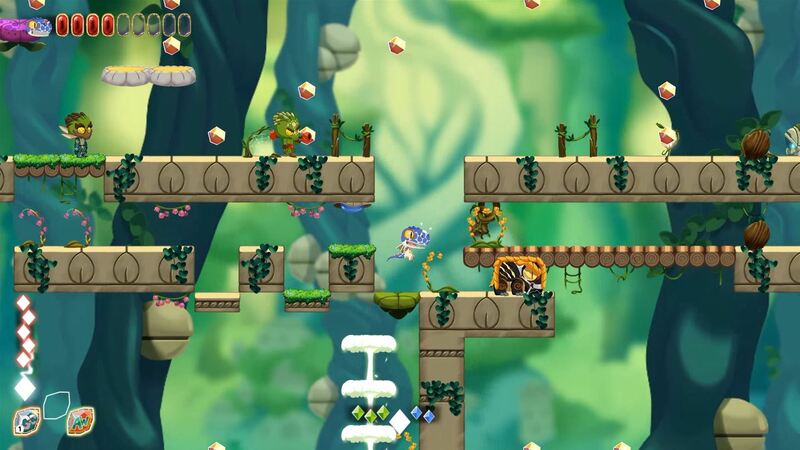 A platformer can only be as good as the physics that hold it together and this is a serious problem for DragoDino. But hey, if you’re prepared to give a new French indie studio a chance, and are prepared to look past the issues, then you’ll find a well priced delightful little game.